What Is Self-Care Anyway? Here’s What You Need To Know. Are you tired of hearing the word self-care yet? 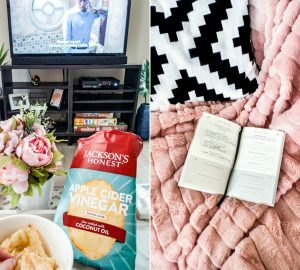 These days, the whole world seems to be talking about making time for you and starting your own self-care routine (oh wait, I totally did that too). Even though this topic is all over the interwebs, I’m definitely glad to see people retreating from the culture of busy and realizing that finding time for ourselves is vital to living a happy and fulfilling life. 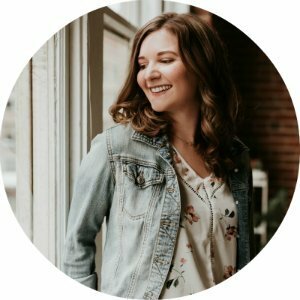 Today, I’m going to break down the meaning of self-care, tell you all about the five different dimensions (which are totes fascinating if you ask me), and give you tons of practical ideas that you can start incorporating into your self-care regime. Boom. Let’s get started with a quick and easy definition of self-care, shall we? I’m going to just pause you for a moment and direct your attention to the word regular here. These are practices we need to schedule into our days often, rather than just once in a while. 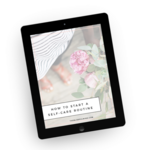 Ultimately, self-care is about finding something that you can do on the regular to make you feel comfortable and relaxed, away from the pressure of your to-do list(s). What’s also important to note is that there are so many different ways to take care of yourself. While certain practices may work for others, you may find that they don’t work for you. I was recently talking to my friend Kayla about self-care, and she said she was having a hard time getting into the typical self-care practices like taking a bath and practicing yoga, but hiking was an activity that really resonated with her because it helps calm her mind down. What is self-care anyway? Here’s what you need to know! There are three different dimensions that I emphasize the most when it comes to self-care: mental, physical, spiritual. 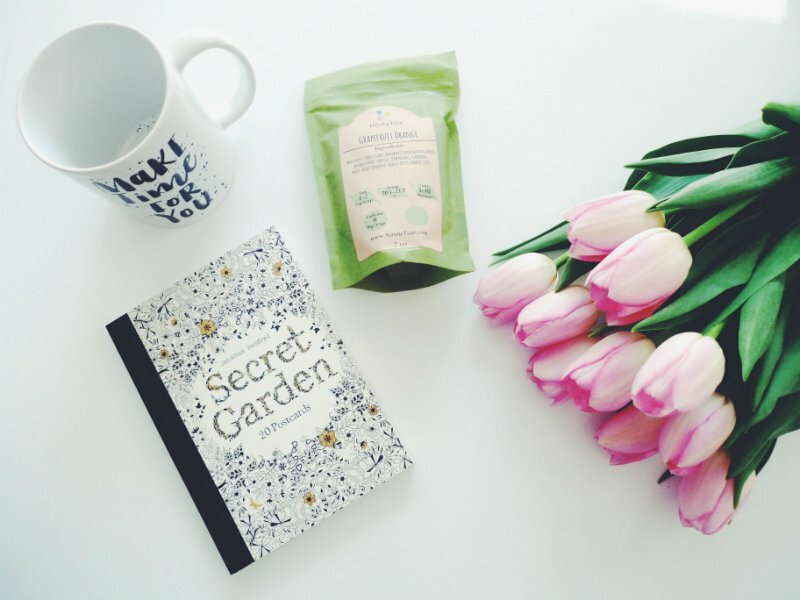 If you’ve tried my self-care routine method, you’ll understand why. There are also two bonus dimensions: social and emotional. 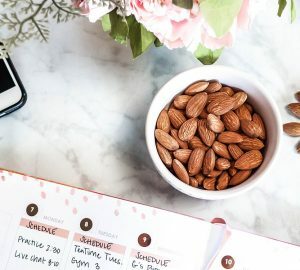 Incorporating activities from each dimension into your life means you’ll be nourishing every aspect in your life and ultimately getting better at self-care (probably without even realizing you’re doing it). 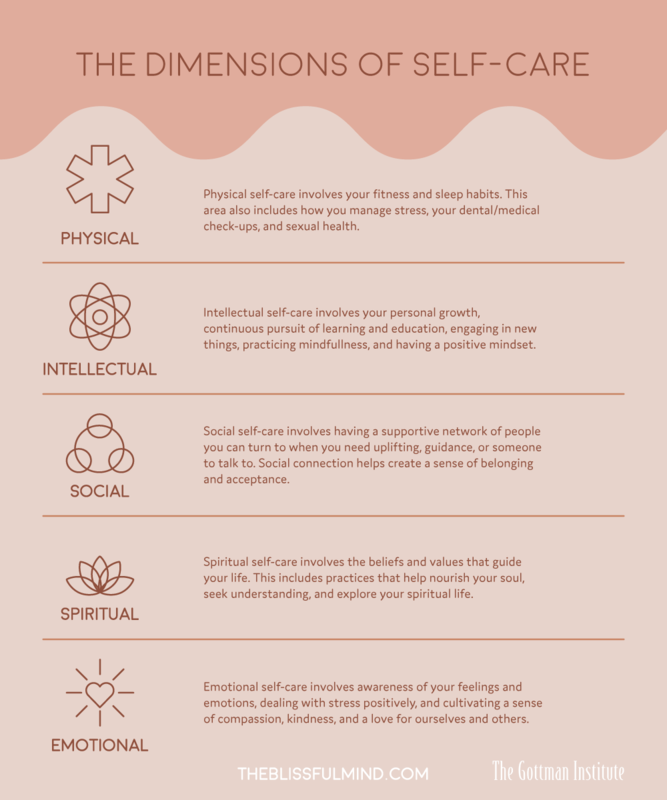 Let’s dive a little deeper into these different dimensions by explaining what they are and how they can benefit you, as well as giving examples for each dimension so you can begin thinking about which self-care practices you want to incorporate into your life regularly. Ready? Let’s do this. The desire to learn new concepts and expand your knowledge contributes positively to your overall well-being. 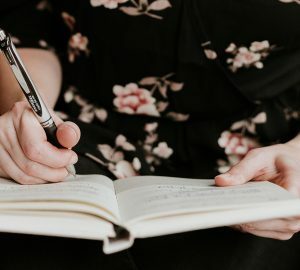 Mental self-care is about finding the balance between stimulating your mind and giving your mind a break, and this can help with creativity, innovation, and continual learning. I’m a big advocate for personal growth, but I greatly appreciate the opportunity to switch off and let my brain rest for a while. The physical dimension of self-care encompasses safety, health, nutrition, movement, physical touch, and sexual needs. When you practice activities for your physical well-being, you can increase your energy levels and boost your self-esteem. Social connection is another important dimension of self-care, even though most people associate self-care with themselves (because, duh, it has the word self in it). But social connection helps create a sense of belonging and acceptance which we humans need, and it allows us to create and share a common bond with others. Thank you to The Gottman Institute for creating this graphic! Now that you’ve learned all about the dimensions of self-care, think about how you might start to incorporate them into your regular routine. Maybe it’s walking with a friend on your lunch break, reading a book before bed, or trying out some positive affirmations in the morning. You could also try incorporating them into the Self-Care Power Hour if that jives with you. Just think about what you would find fun or relaxing and make a conscious effort to do more of it! What do you think about the five dimensions of self-care? Have they changed your perspective of self-care in any way? Let us know in the comments below! 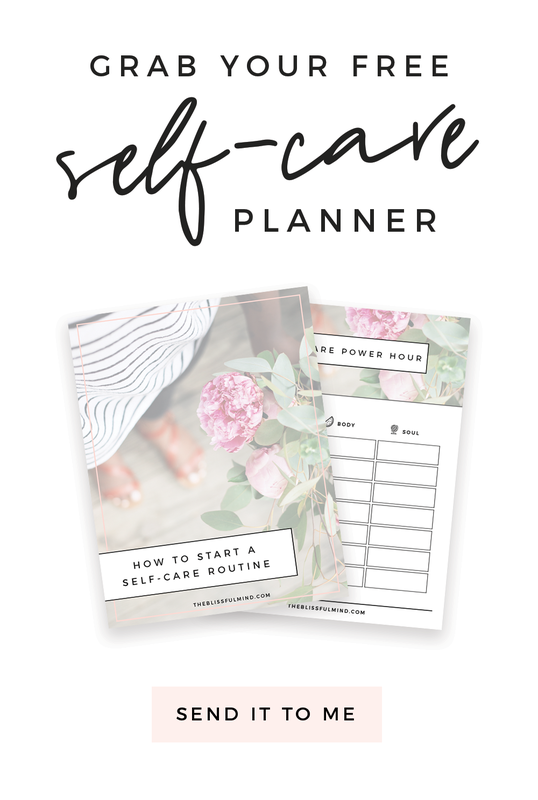 I’d love to hear about your favorite self-care practice and how you plan to incorporate the self-care dimensions into your routine. YES YES YES. Love this post and couldn’t agree more with all of these points! Thanks so much, Les! 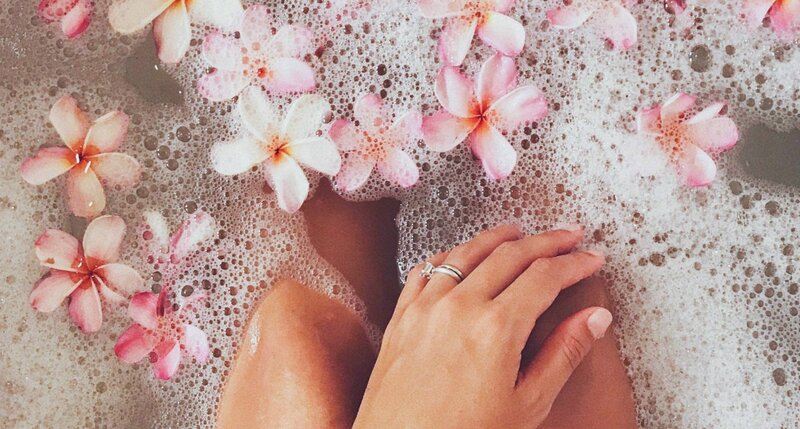 I know how much you love self-care too! I loved this! We need these reminders! I love how this is broken down into parts with examples! It’s almost as if you can master one part, then the other, then the other, instead of trying to change all of them at the same time! That’s definitely right, Cloe! And a lot of times, if you just focus on one area you end up taking care of other dimensions at the same time! I absolutely loved reading this. I’ve always liked the idea of self-care but I honestly never knew how to put it into practice. I love the way you’ve split this up and given suggestions for each – can’t wait to start putting these into action! 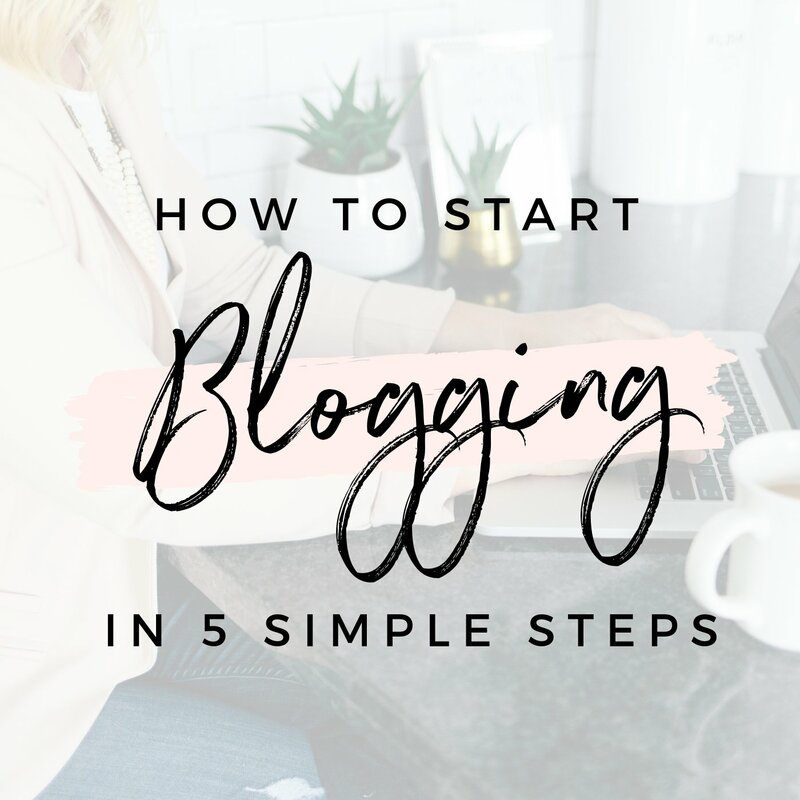 Really love this post, great practical tips for everyone! I really hope it helps, Andrea! This is a really well-written post full of great ideas! I generally focus on the physical part of self care and neglect the others – something to work on! Thank you, Odessa! I tend to focus on the intellectual and emotional areas, and physical is probably my most neglected haha. Thank you, Sam! Looks like Kelly went ahead and fixed the code! I love this post! And how it is broken into subsections. I tend just group self care into mental and physical, which really isn’t enough. I need to expand my definition! I saw the picture of the book “my Paris dream by Kate.” how was it? This is an amazing post! I love that you broke it down into the areas and gave a whole chunk of examples. So well-written! What a lovely post. 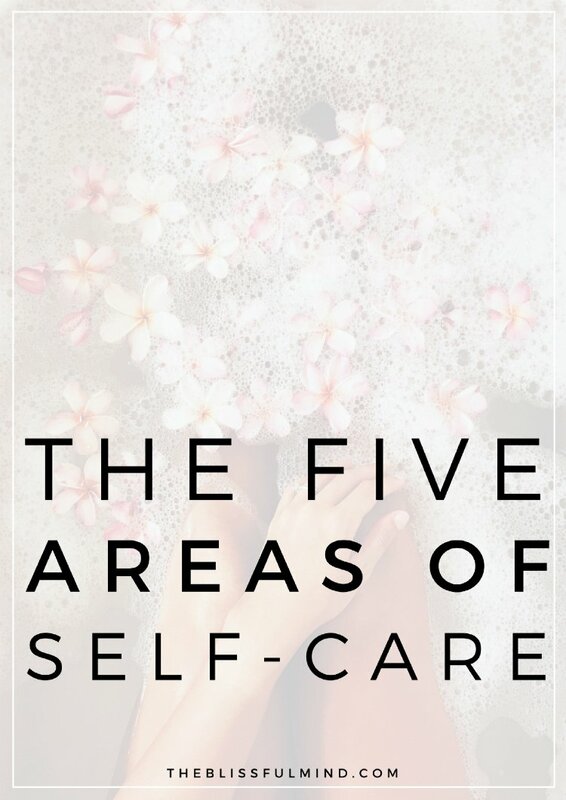 I hadn’t thought about self-care in this way, and I realized I don’t hit all 5 aspects when I do make time for myself. It’s so smart to be intentional about the kinds of self-care we do! What an awesome post! It’s true that self-care is not something you do whenever you’re down but regularly to reduce depletion! how can I get the pinterest pic as a pdf? I really would like this for my vision board/yearly planner. Excellent! If we take care of ourselves in the many dimensions in life and seek balance, we are more likely to have better relationships! Beautiful post!! I have always thought of it like this as well, with the addition of Material Self-Care. This includes thing like a properly fitting bra, underwear without holes, that pair of jeans that makes you feel fantastic, etc.! Omg yes I love that!! Didn’t even think of it, but those things make a huge difference. Your approach to self care is a much appreciated fresh perspective in an otherwise buzzword crazy society. Wonderful and insightful post. It helped me a lot. Reading your blog is kind of a mental self care for me because I don’t focus on school and enjoy a good blog entry aha.